Tanner Daniels: Is it just me or is she, like, the worst Mormon ever? Fawcett Brooks: It is SO not just you. She's cray-cray. A high school comedy with HEART and BRAINS! I tire quickly when a high school comedy pops onto the scene with stupid adults and know-it-all kids who look too mature for the roles. Kudos to writer George Northy for giving his kids heart and the grown-ups brains, it elevates this film above the bulk in his genre. Director Darren Stein is very judicious in his nods to similar films -- Clueless, Mean Girls, Heathers, Carrie, and nearly every John Hughes film. RESTRAINT is what makes this film so enjoyable: Megan Mullally manages to escape the curse of Will & Grace alumni and is able to NOT rehash Karen walker, but create a new character. Paul Iacono is brilliant and I can't imagine him as any other character -- which is how I felt about his TV character RJ Berger, who is worlds apart from this role. Sasha Pieterse is blond Denise Richards pretty, but a whole lot smarter. Xosha Roquemore is all legs and laughs. She mutters a brilliant line that made me bust out laughing: "I ain't mad at that" -- watch for it. She owns the role and is smart! 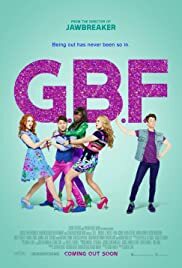 G.B.F. smacks of a cult favorite and star-maker. I suspect in a few years we'll look back at this pop-masterpiece and marvel at all the now-celebrities who broke-through in this cast. 24 of 37 people found this review helpful. Was this review helpful to you?